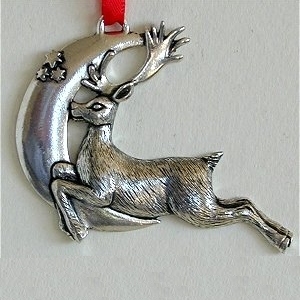 Edward and Maureen Story-Jones set up their successful company, Silver Scenes Ltd, in 1984 in their home in the hamlet of Brooks in Montgomeryshire. The Company expanded rapidly and by 1989 the business had moved to larger premises in the attractive village of Berriew in Montgomeryshire. It is here that the entire Collection is designed, crafted and produced to the highest standards by a conscientious and skilled workforce. 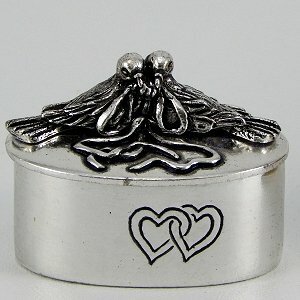 All pieces are cast in pewter then silver plated. 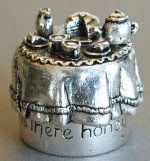 Each box has a related verse that encircles it. 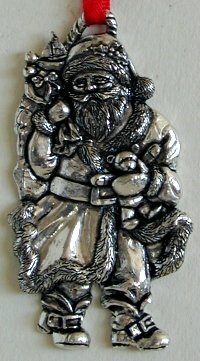 They are shown larger than life to give you a sense of the detail. 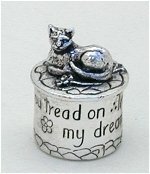 Silver Scenes Cat box. 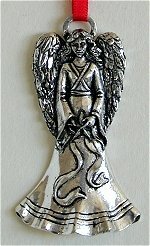 Silver plated pewter, made in Great Britain. 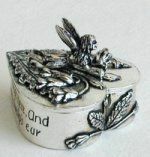 Silver Scenes Dove and Ribbons box. Silver plated pewter, made in Great Britain. 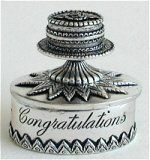 Silver Scenes Congratulations box. Silver plated pewter, made in Great Britain. Silver Scenes Cowslip Fairy box. Silver plated pewter, made in Great Britain. 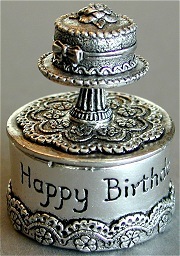 Silver Scenes Happy Birthday box. 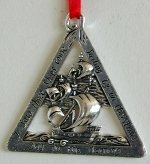 Silver plated pewter, made in Great Britain. Silver Scenes Tea Time box. Silver plated pewter, made in Great Britain. 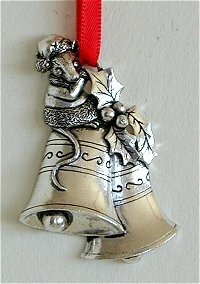 A small mouse sits atop the Christmas bells ready ot hang on your tree. 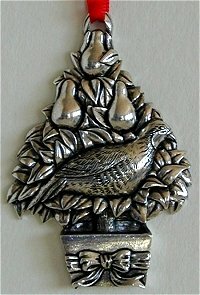 In Middle English pertriche 'partridge,' was derived from Perdix, one of Athene's sacred kings, thrown in the seas from a tower, and carried to heaven in the form of a bird by his goddess. 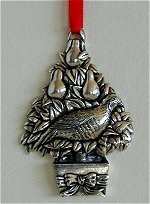 He was the partridge, she the pear tree. 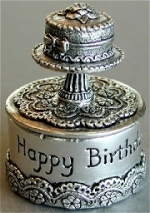 From 1558 until 1829, Roman Catholics in England were not permitted to practice their faith openly. Someone during that era wrote this carol as a catechism song for young Catholics. It has two levels of meaning -- the surface meaning plus a hidden meaning known only to members of their church. Each element in the carol has a code word for a religious reality which the children could remember. Christmas presents in a Christmas stocking. 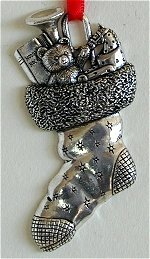 A very merry Christmas Santa. The Holly and the Ivy is thought to have Pagan origins and could therefore date back over 1000 years. 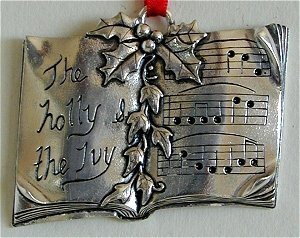 It is most unusual for a carol like the Holly and the Ivy to have survived over the years especially during the stern protestant period of the 17th century. The Holly and the Ivy have always been taken indoors during the winter the hope being that the occupants would survive difficult conditions just like the hardy Holly and the Ivy. The colours of the Holly and Ivy, green and red are traditionally associated with Christmas.